I have had a wonderful year serving on the TOS Review Crew. It's hard to believe but this is my last review as a crew member. 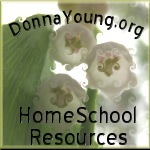 I've had the privilege of trying so many great products and it has helped me learn what will and will not work in our homeschool. I was very happy to receive Considering God's Creation by Eagle's Wings for my final Review. I had seen samples before and it looked like a great program. The Teacher's Manual, complete with audio CD and a student book are available for $29.95. Extra student workbooks can be purchased for $13.95. Eagle's Wings also offers other products - History, Bible, Phonics, Geography and Math. For a full list please click here. This is a real bargain. It is a life and earth science program written from a Creationist point of view that spans grades 2 to 7 though it is easily adapted for any age. We used it as a supplement to our regular curriculum but this could be used as a stand alone program as well. It does not have to be followed in the order it is presented. It uses hands on approach to each topic through the use of notebooking pages, crossword and word search puzzles, pull out charts and foldables. It works well for a hands on, visual or audio learner (thanks to the songs on CD). Each topic has several subtopics for a total of 36 lessons. My middle son was all about the crossword puzzles and and the star slides activity. He loves space and planets and these notebooking pages and activities were well laid out and he could work independently. I will probably be using this as my youngest son's main Science curriculum in the fall. It's visual and hands on plus it's easy to use for short lessons. The Teacher's Manual is well laid out. It tells you how many lessons the topic will span, materials you will need to complete the lesson and suggestions on how to dig deeper with a topic of interest. These include suggestions for DVD/Videos, books, experiments and research topics. Some lessons include suggestions for vocabulary words and Bible readings. My boys didn't get much out of the songs and the audio CD which comes with the Teacher's manual. An auditory learner most certainly would benefit. This is a quality product at a very good price. It's nice to go out reviewing a product I can recommend with no reservations.